The visual field is the extent of your peripheral or side vision. A visual field test is carried out to see how dim a light can be and still be seen in your peripheral vision. Some medical conditions affect the visual field of one or both eyes without reducing visual acuity (central vision) and you may therefore be unaware of a field defect. 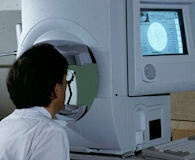 Visual field tests may be carried out on several different types of equipment. The equipment selected depends on the reason for doing the test. Generally a visual field test takes between 15 to 45 minutes to complete. You should bring any current spectacles to the test appointment.